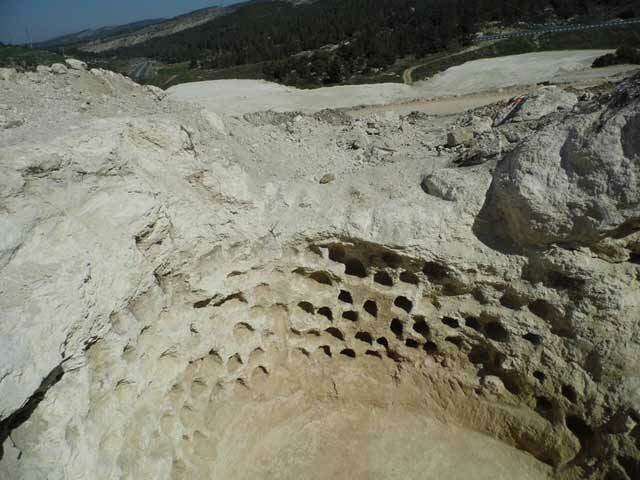 In February 2014, a salvage excavation was conducted at Ramat Bet Shemesh (Permit No. A-7031; map ref. 20050/62375; Fig. 1), prior to the construction of a road. The excavation, undertaken on behalf of the Israel Antiquities Authority and financed by the Ministry of Construction and Housing, was directed by Z. ‘Adawi (field photography), with the assistance of S. Gendler (metal detection), A. Hajian and M. Kunin (surveying and drawing) and D. Levy (GPS). 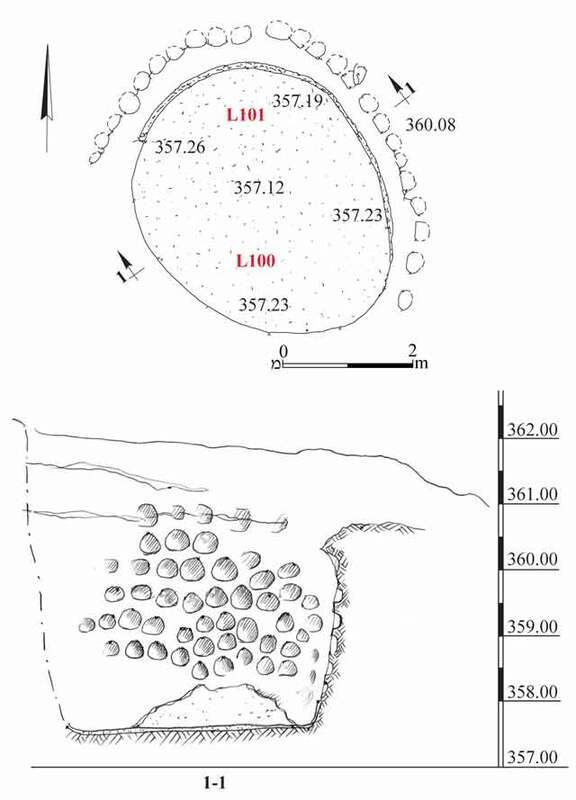 The excavation area, located on the eastern ridge of the Judean Shephelah, lies within a region that was systematically surveyed in the 1990s by Y. Dagan (2010) and where additional surveys and excavations were conducted (Dagan 1995; Nagorsky 2010; Dagan 2011). 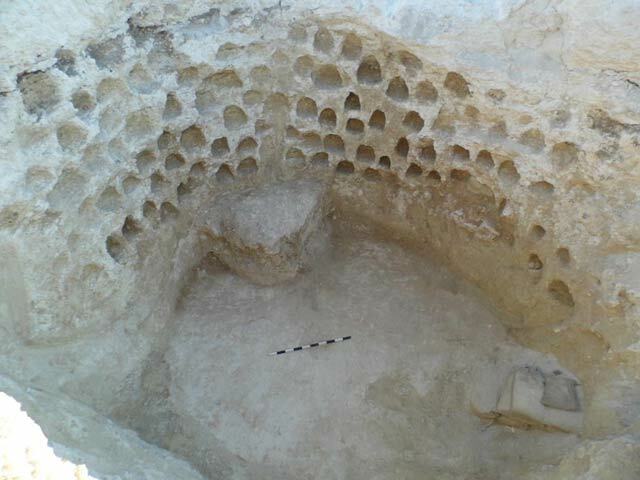 The current excavation was situated along the slope of a spur that descends northward toward Nahal Zanoah, c. 3 km northeast of Bet Natif, c. 350 m northeast of Khirbat Umm edh-Dhiyab and c. 1.5 km southeast of Tel Zanoah (Dagan 2010:133–138, 258–261). Remains of a farmstead dating to the Byzantine period were excavated c. 350 m to the north (Permit No. A-6959). Agricultural installations, stone clearance heaps, a field tower, remains of ancient and modern field walls and a columbarium, whose excavation was halted due to safety concerns, were recently exposed to the north of the excavation area (License Nos. B-391/2013, B-408/2013). The current excavation was carried out in order to complete the excavation of the columbarium (L100; Fig. 2). For safety reasons, mechanical equipment was used to remove its ceiling, as cracks were detected in it. The southern and eastern walls were partially damaged, most probably during the dismantling of the ceiling. The entire installation was hewn in soft limestone; columbarium niches could be discerned on the two surviving walls. A vertical shaft (diam. of opening 1.1 m, depth 2.08 m), hewn in the columbarium’s ceiling, apparently served as the original entrance. It leads into an elliptical chamber (diam. 4.6 m, height 3.2 m). The chamber’s bedrock floor was leveled and covered with a layer of gray plaster (thickness 4–5 cm) composed of marl and ash. The plaster also covered the northern and western walls to a height of 0.8 m above the floor, up to the bottom rows of niches (Fig. 3). No plaster was identified in the upper part of the cavity. Both small (c. 0.2 × 0.2 m, average depth 0.2 m; Figs. 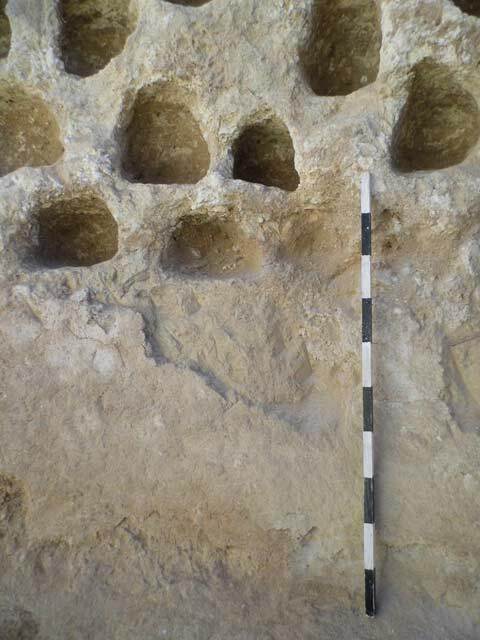 4, 5) and larger (c. 0.3 × 0.3 m, depth 0.2 m) niches were hewn in the chamber’s walls. A more accurate quarrying of the niches may have been impossible due to the crumbling rock. The niches were hewn closely together with no apparent arrangement, although the spacing between them was practically equal. The installation was completely filled with earth and rock fragments from the collapsed ceiling and walls. This accumulation contained few, non-diagnostic potsherds and dozens of building stones and architectural elements that had been tossed into the installation. The columbarium probably belonged to a settlement or farmstead situated nearby. Its date of construction and usage could not be ascertained; however, parallels from elsewhere suggest that it dates to the Hellenistic and Early Roman periods, when there was an increase in settlement in the Ramat Bet Shemesh region and the Judean Shephelah (Dagan 2011:265–274). Dagan Y. 1995. 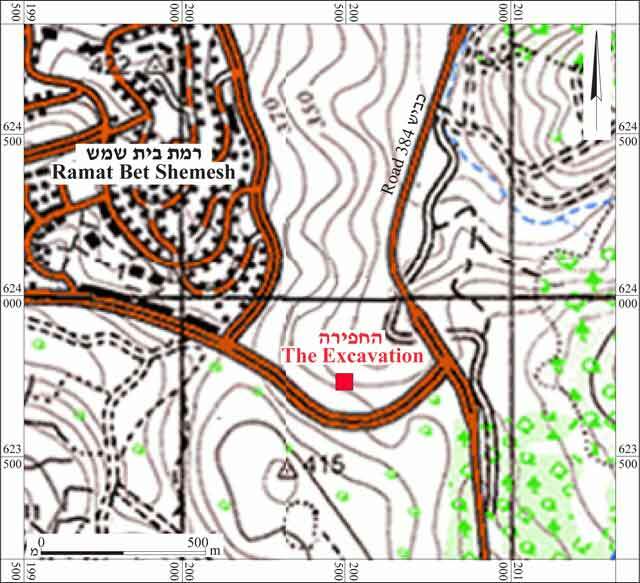 Bet Shemesh and Nes Harim Maps, Survey. ESI 13:94–95. Nagorsky A. 2010. Bet Shemesh, Survey of Ramat Bet Shemesh Area. HA-ESI 122. 3. Plaster at the bottom of the northern wall and on the floor of the installation, looking north. 4. The walls inside the columbarium, looking north. 5. The walls inside the columbarium, looking north.